JOHN 15:7 KJV "If ye abide in me, and my words abide in you, ye shall ask what ye will, and it shall be done unto you." 4Abide in me, and I in you. As the branch cannot bear fruit of itself, except it abide in the vine; no more can ye, except ye abide in me. 5I am the vine, ye are the branches: He that abideth in me, and I in him, the same bringeth forth much fruit: for without me ye can do nothing. 6If a man abide not in me, he is cast forth as a branch, and is withered; and men gather them, and cast them into the fire, and they are burned. 7If ye abide in me, and my words abide in you, ye shall ask what ye will, and it shall be done unto you. 8Herein is my Father glorified, that ye bear much fruit; so shall ye be my disciples. 9As the Father hath loved me, so have I loved you: continue ye in my love. 10If ye keep my commandments, ye shall abide in my love; even as I have kept my Father's commandments, and abide in his love. If ye abide in me, and my words abide in you, ye shall aske what ye will, and it shall be done vnto you. If ye abide in me, and my words abide in you, ask whatsoever ye will, and it shall be done unto you. If you are in me at all times, and my words are in you, then anything for which you make a request will be done for you. 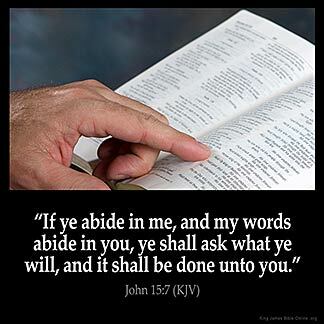 If ye abide in me, and my words abide in you, ye may ask what ye will, and it shall be done to you. If you continue in me and my sayings continue in you, ask what you will and it shall be done for you. If you remain in me, and my words remain in you, you will ask whatever you desire, and it will be done for you. If ye dwellen in me, and my wordis dwelle in you, what euer thing ye wolen, ye schulen axe, and it schal be don to you. 15:7 If ye abide in me, ye shall ask - Prayers themselves are a fruit of faith, and they produce more fruit. Joh 15:7 Ask what ye will, and it shall be done unto you. The condition of this blessed promise is that we abide in the Vine, by having Christ's words abide in us. This has been my favourite verse from childhood. I have found it to be true. God has been there for me through every calamity and upheaval in my life and will continue to be there. Amen. Gods words are our daily food to eat " daily and digest , is the Spirit for our life! Father, I ask tonight for healings for my wife 's grandmother and her heart condition. I have seen you work miracles in my life more time than I could ever remember, things that I saw your fingerprints for a sign and knew they were gifts from heaven. I pray that you also leave your fingerprint in her healing for a sign to help spread your Gospel and glorify your Son. I ask in faith. In Jesus 's name. Amen. The LORD 's fingerprint is when you witness somthing that couldn 't shouldn 't wouldn 't happen but you pray for it and it does! Praise the Lord! You cannot separate Jesus from the word and you cannot separate the word from Jesus . They both are one and you cannot have the one without the other. Praise Good for His word. I Thank God that I have the comfort of God 's word through this life that I am living now. I cannot express how much His word means to me. I cannot live without Him and I cannot do without Him but I can do all things through Christ which strengthens me !!! Praise God forever more . His word keeps me on the straight and narrow path.